Volcanoes can be beautiful and mesmerizing, catastrophic and terrifying, and we’re here to tell you a bit about the latter kind. Here, you’ll find some of the most cataclysmic (cat-a-clizmic) and destructive volcanic eruptions known to humankind, as well as learn a bit about their history and just what it was that made them so powerful. We now present to you CRAZIEST Volcanic Events in History. Vesuvius is arguably the most famous volcano on Earth. It towers above Campania, Italy, and is just 5.6 miles east of Naples. It is only one volcano in the Campanian volcanic arc and is a volcanic cone. It is encircled partly by the rim of a caldera that was caused by the collapse of Mount Somma, which was a much larger and higher structure. Vesuvius grew out of Mount Somma, and it has erupted many, many times in ancient history and in recent times, although one of those eruptions stands out among the rest. 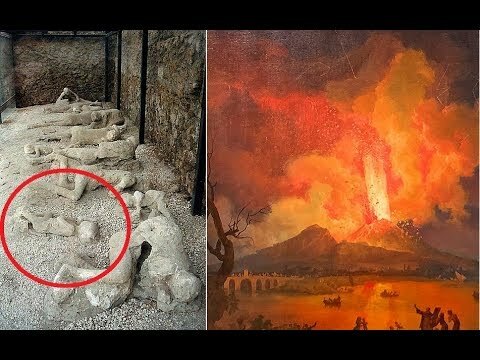 The eruption in AD 79 is probably the most famous and devastating eruptions to occur in human history; gases, ash, and stones were blown out of the volcano to a height of 21 miles and produced around 100,000 times as much thermal energy as the bombs dropped on Hiroshima and Nagasaki. Pyroclastic surges overtook and buried the city of Hercu-laneum in 75 feet of tephra, and Pompeii was buried under almost 39 feet. More than 1,000 people lost their lives in the eruption, and roughly 1,044 casts were made from impressions of bodies found in ash deposits and pyroclastic surge deposits in PompAY and the surrounding area by 2004. Three hundred thirty-two have been found in Hercu-laneum. This eruption is called many things: the Minoan eruption of Thera, Thera eruption, Late Bronze Age eruption, and Santorini eruption. This major event is thought to have had a Volcanic Explosivity Index of either 6 or 7, and it’s believed to have happened sometime between 1642 and 1540 B.C. It was a massive eruption that completely devastated the island then known as Thera, which is now called Santorini. In 2006, it was found that the volume of materials released from the volcano, its dense-rock equivalent, was about 24 cubic miles. That means that it kicked out about four times more material than Krakatoa! On Santorini, there is a layer of white tephra that measures 200 feet thick, and in some places, you can see the exact level of the ground before Thera erupted. This eruption was an Ultra Plinian (PLEE-NIAN) (Plinian eruptions are eruptions similar to Vesuvius), and the column of debris breached the stratosphere when it shot between 19 and 22 miles into the sky. It also spawned tsunami waves that built to staggering heights: between 115 and 492 feet tall. We’ve all heard of Yellowstone, and most of us know that it’s been a hotspot (literally) for volcanic activity for a very long time. You’ve also probably been told that if the volcanism in the area were to graduate into another full-blown eruption, it would be cataclysmic. But just how bad were eruptions here in the past? Well, it last had a full-blown eruption some 640,000 years ago, which ejected an enormous 250 cubic miles worth of material into the atmosphere, but it wasn’t the first of its kind. Yellowstone also erupted 2.1 million years ago, and that was called the Huckleberry Ridge eruption, which formed the Huckleberry Ridge Tuff and the 50 X 40 mile Island Park Caldera. It erupted again 1.3 million years ago in what was called the Mesa Falls eruption, which formed the Mesa Falls Tuff and the 18 X 23 mile Henry’s Fork Caldera. The massive eruption 640,000 years past was named the Lava Creek eruption, and if you’re getting the pattern, you’ll know it created the Lava Creek Tuff and left behind the Yellowstone Caldera, which measures 34 X 45 miles. The eruption itself was roughly one-thousand times more powerful than Mount St. Helens, and it’s believed it contributed to the changing of world weather patterns and extinctions.